Congratulations to Amal.She is still 37.wishing you more success in your life. Because of her, People magazine is now writing about human rights issues! Now that’s power! LOL. According to the Washington Post, Amal and her colleagues are due to present a 300 page report to the Greek Government about the Elgin Marbles. This could explain why she has been living out in LA with George and keeping such a low profile. She can work remotely from LA/NY and is probably hunkered down writing the report. I’m not sure if it’s a good thing that People magazine is now writing about human rights issues. They do not present these issues very well and objectively, and use their inappropriate “gushing” style in writing them. They also title them with misleading titles, using unnecessary words like “demands” that portray an inaccurate tone. I used to love reading gossip sites, especially the comment sections. However, now I try to avoid reading most of them, especially articles about George and Amal, because they are infested with very mentally disturbed trolls that go further than being ignorant and catty to making some serious defaming accusations against Amal. Anyways, I wish Amal more success and I hope she will be able to step over the whole low hollywood way of life or at least cope with it. I am with you Clara. it is really disturbing to spent 5 minutes reading comments on most of those sites. Some people say some terrible things that, one with a right mind can tell is not true or nonsense, and there are some commentators that are really vicious, they go on and on,,,,i would say even evil, make threats. I almost never read comments. Until this blog came along and Amal, i had never commented online on anything. And most likely i will run mentally exhausted of it soon:) There is very nice people, like yourself, but many times i have lost focus on what i was doing at such or such page article, because the negative comments drags you into an insane wolrd that becomes the comments:) One subject ends up transformed into a whole different nonsense conversation, especially if the sites are already that kind of gossip site. “she is joining the guy in Egypt …” Last week, her visa was ready. It is possible that she is currently in Egypt. Her visit could be not covered by the medias for security reasons. Love your blog. There is an article in the Washington Post you may find interesting that a shipping magnate is now paying legal fees for Greece in regard to the Elgin Marbless. All these racist and negative comments specially in Just Jared and Daily Mail are produced by People which start by letter “J” and the jealous women.There is no third possibility.I am from the same part of this world where Amal was born and I know very well the mentality there.What’s wrong with Amal to write all these comments about her?Because she is a successfully Lady and she is paying the price for this success.In French we say:”c’est malheureux mais c’est vrai”. Finally I would like to say to the women who like Amal that don’t bother and don’t care from these negative comments.We know who is controlling the media in States. I don’t read these comments. People are so nasty, probably jealous. I see the same situation with the Duchess of Cambridge or Pippa Middleton. 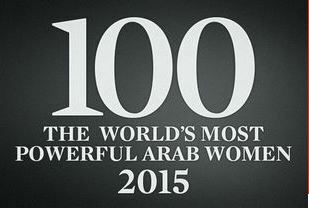 Unknown until a year ago- now the second most powerful Arab woman in the world? Hello?? Do we all live in the same world? Not very good for feminism is it when all this happens through marriage to a famous man.? 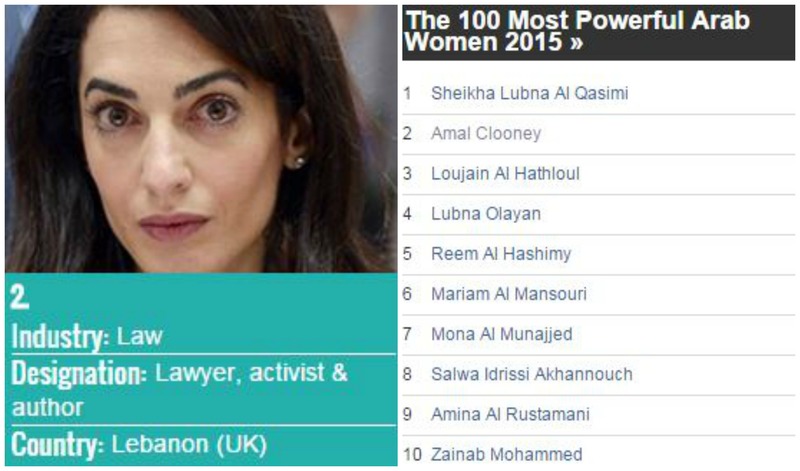 Does it compare with a woman (further down the list) bravely driving and risking jail or more in Saudi Arabia? That is what fighting for human rights really means. Well done to George Clooney’s PR advisor, he has the best in the world and has positioned Amal with brilliance. If Amal was any good at all, Julian Assange wouldn’t have been hiding from justice for the last three years in an embassy in London. Can we wake up here and stop the undeserved celebrity swooning? both women deserve the utter respect and recognition for their accomplishments. there aren’t a lot of Arabic women who are rebelling against their oppressive monarchies and theocracies and at the same time there aren’t a lot of Arabic women who went on to become international lawyers. I don’t know the reasoning behind the order in which these women are listed. However, aren’t you unintentionally working against women and encouraging the predominant oppressive mentality of Arabic men when you assume that Amal’s recognition for her accomplishments is only due to her marriage. men like to take credit for everything and you’re helping them do that. yes her marriage exposed her to the spotlight. However, she accomplished what she did before and regardless of her husband. her husband didn’t help her one bit because he doesn’t have a law degree, let alone any college degree. In fact, I can argue that her husband hindered her career. Finally, when it comes to your Assange comment, as I explained before, unfortunately the lawyers don’t have much of a saying when the bigger brothers are talking. what Amal can do is to represent Assange well in court if and only if the governments involved guaranteed a fair trail for him, something Assange fear will not happen. Sorry, but that is rubbish. Until Alamuddin hitched on to Clooney, she was a junior barrister who was completely unknown. Then meets Clooney and suddenly she’s the most famous person in the world with a wardrobe to match. Give us a break. Geoffrey Robinson is the huge lawyer and she is a junior. There are about 40-50 like her just in her firm. So it’s all about the marriage. Why not just acknowledge it?